HashTag (해시태그) is a new rookie girl group from the agency LUK Factory. They were put together and produced by Kan Mi Yeon, a former member of the legendary girl group, Baby V.O.X. They debuted this past year on October 13th with the song ㅇㅇ(Hue) from their first mini-album called “The Girl Next Door”, which also contains 5 additional tracks. The members consists of Dajeong (다정), Hyeonji (현지), Sojin (소진), Subin (수빈), Seongmin (승민), Aeji (애지), and Sua (수아)! These seven girls have just the right talent and charm to make you fall for them! As you guys have just debuted, would you mind introducing yourselves and your positions in the group? Hyeonji: Hello! I am Hyeonji, the sad little girl of HashTag. I am the oldest in the group but I have a baby face. I am in charge of sub-vocal. Please take good care of me! Dajeong: Hello! I am the sentimental Dajeong and also the leader of HashTag. In the group, I am in charge of rap and dance. Please take good care of me! Seungmin: Hello! In HashTag, I am… what do I say? I am the timid Seungmin and I’m in charge of main vocal! I hope that you will support us! Sojin: Hello! I am Sojin and I am the sassy and boisterous, like a key ring! I am the sub-rapper of HashTag>_< Thank you! Aeji: Hello! I am the lovely Aeji and I am the youngest. In the group, I am in charge of the killing parts and beautiful dancing! Please take good care of me!!!! Thank you!! What kind of emotions do you feel now that you have debuted? All: We still can’t believe it and it feels like a dream! We are anticipating our future activities and there are many things that we still haven’t got to show you so we want to hurry and show you guys our charms! I saw your first stages and your voices are just amazing. Were you guys nervous? All: We were very very nervous. So much so that we couldn’t even sleep a wink the day before. But on stage, we just woke up! I really won’t forget it! I am asking this because I am just curious but… what is the meaning behind the name Hashtag? All: To us, HashTag means a tag. It starts something so when people react to it, they each put this tag on it so just like building chemistry, you gather of these reactions up and it creates a flow. We made the name HashTag with that sort of meaning. As a group, what message do you want to portray through your music? 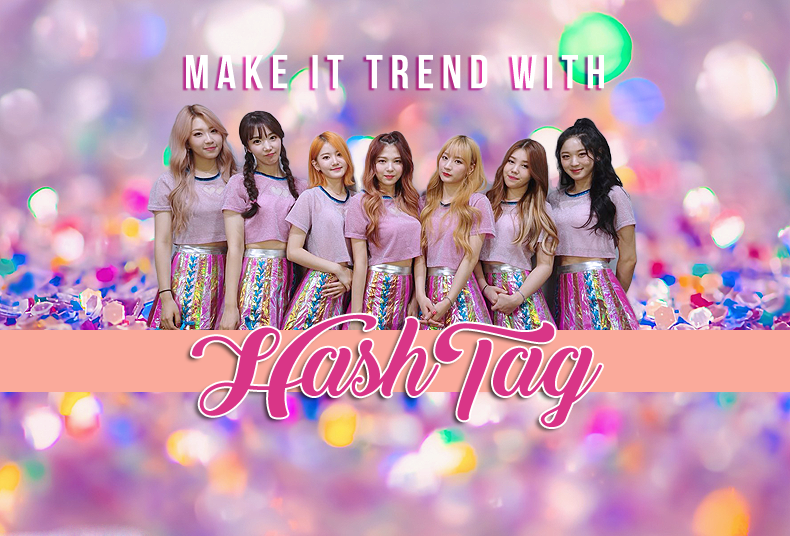 All: We, as HashTag, have the concept of “reality girl idols,” so we want express things that could happen in your daily life and we want to do that in a way that only we as HashTag could. Now, I saw your videos on YouTube where you went through the city asking people if they had an SNS account and asking if they would promote you on there. It was very cute. What are some other types of activities that you want to try or plan to do? All: Thank you for thinking that we looked cute! Last time, we ran around to let people know who we are so this time, we want to take time to spend time with everyone. For example, like singing and dancing for busking! We think that it’ll be really fun. If you think of Hashtag, you immediately think of SNS. So what is something that you guys frequently like to look at on SNS? All: We tend to watch our stages and the stages of our seniors as well. We also have a big interest in clothes so we also look at fashion. Sojin: I have a good memory and I have a big desire to collect things so I have a big interest in many different things and do a lot of studying on these things too. I also can adapt to a language very quickly. If I get the chance, I want to study even more languages than what I am studying right now. Dajeong: Although I am a girl, my sideburns tend to be as long as a guy’s! Aeji: When I was younger, I majored in dancing so I am a bit flexible! I have my own special talent of being able to do the crab dance flexibly! Hyeonji: I have the biggest eyes out of all my members! I almost never wear contacts! Subin: First off, a special thing about me is that I’m the tallest in all of HashTag!! My talent is doing a powerful dance, whilst being tall! Seungmin: In the group, I am in charge of main vocals and I love singing. Not only that, I work hard and good at practicing! As a group, can you tell me one thing that you would like to do together just for fun? Now, Seungmin, I saw the video you uploaded of your cover of All Of My Life by a singer named Park Won. Your voice is so amazing and very emotional. I almost cried. Are there some other songs that you would like to cover? I would love to hear them! Seungmin: Thank you! hehe From now on, I want to cover various songs. Even ones that the fans request also. I want to do a cover of Taeyeon sunbae’s and Zara Larsson’s songs!!! And for all the other members, is there a song you want to cover or maybe a special dance to a song that you would like to do? I also would love to see those. All: In our group, there are 3 people who are in charge of dance positions!! Dajeong does hiphop dance, Subin does powerful dances, and Aeji has the beautiful dance line! We plan to film dance covers too, not just song covers! Personally, I like the dance that goes with Ariana Grande’s Into You. Ah, there is one question that I really want to ask. Do you guys have your fanclub name picked or have ideas for a name? All: We still haven’t picked it yet but we have a few ideas! We hope to get the opinions of everyone and pick it quickly! Thank you so much for taking the time to do this interview. In closing, as you guys are fairly new, is there something you guys would like to say to those who don’t know too much about you? All: From now on, we will continue to keep developing and show you many good songs! We, as HashTag, will work hard so please support us! Thank you!!!!!!!!!! They were so kind to take time out of their busy schedule to do this interview. Do you love them now as much as I do? ㅇㅇ (Hue) is an awesome song and I really hope that you will support them and give them lots of love. Do you have any ideas for their fanclub name or any videos you personally want to see? (I personally like the name “Trendsetters” but… :P) Please leave comments below!